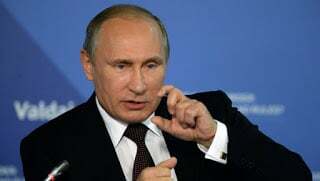 Russian president Vladimir Putin has proposed a bill to the country’s legislature to eliminate the dollar and the euro from trade between member states of the Commonwealth of Independent States (CIS). A statement from the Kremlin said that Putin submitted to the State Duma a draft federal law which seeks an integrated currency market in the CIS. “This would help expand the use of national currencies in foreign trade payments and financial services and thus create preconditions for greater liquidity of domestic currency markets,” said the statement. Russian officials say they seek to drop the dollar and the euro from their exchanges with former Soviet Union countries to achieve macro-economic stability in the region. They say using Western currencies could seriously increase the risks associated with trade especially at a time when the United States and its European allies are in a political row with Moscow over the situation in Ukraine. Russia has managed to move ahead with its plans to weaken the dollar through deals it has reached with some other countries. Members of the Eurasian Economic Union (EEU) – including Russia, Belarus, Armenia and Kazakhstan – have already signed an agreement to switch to their national currencies. One such obligatory transition must take effect between 2025 and 2030. China has also decided to use the Russian ruble in trade exchanges in its border cities.